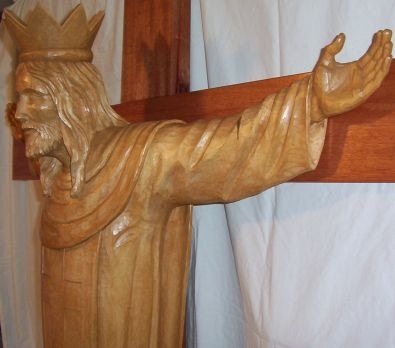 Christus Rex (Christ the King) carved from basswood with a mahogany cross. The cross is about 7 feet tall. 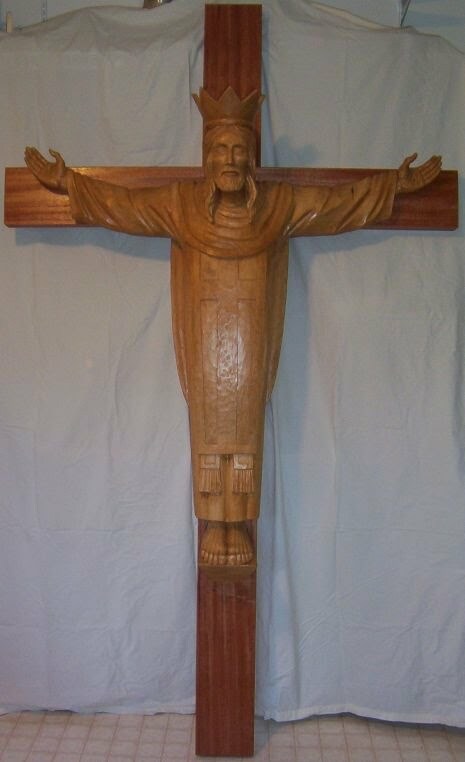 This is carving was made for a church that commissioned a large scale carving similar to a Christ the King crucifix I made many years earlier. 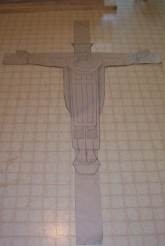 Following is a photo of that older carving along with a series of pictures documenting the making of this carving. 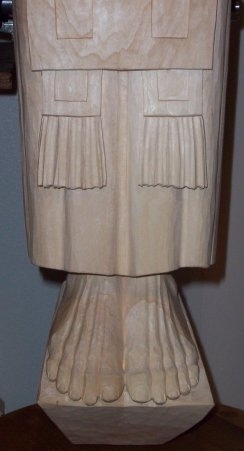 This version is approximately 19 inches tall. 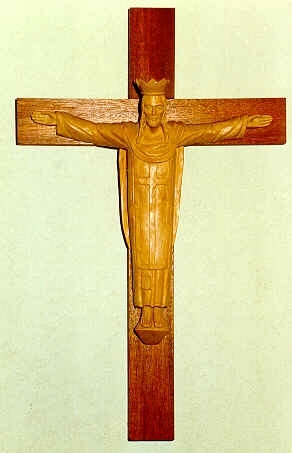 It was carved in basswood and mounted on a mahogany cross. 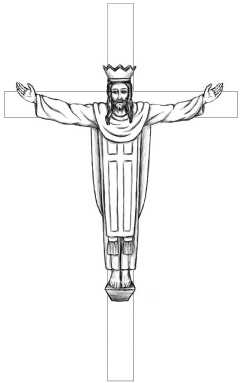 In the new design sketch, you can see that the hands have been raised along with some other minor changes. Some of the layers (that will be glued together) have to be glued up for width first. 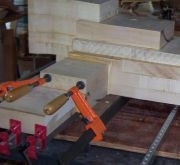 The layers of wood are glued together one joint at a time with lots of clamps for even pressure. 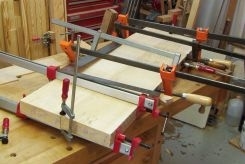 Lots of clamps! 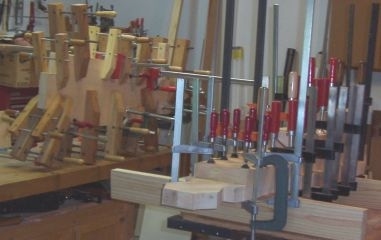 Special thanks to Roger Fischer of Fischer Woodworking. His expert assistance was invaluable. 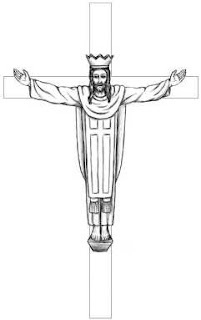 Don't forget some wood for the arms! 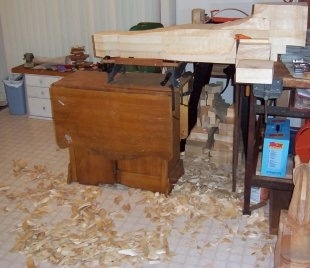 Ready to start with the chisels and mallet. 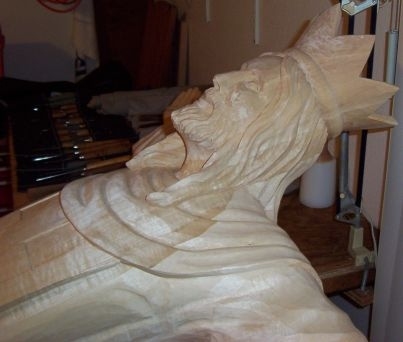 Roughed-out. 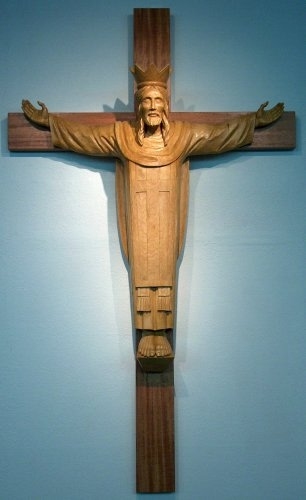 A lot of wood has been removed. Finishing up the left hand. Nearly done with the feet. Applying Minwax Water-Based Wood Stain over Pre-Stain Wood Conditioner. Applying several coats of Tung Oil to the Honduran mahogany cross. 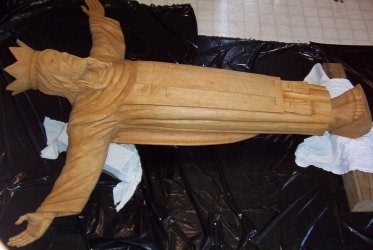 After waxing and buffing, it's ready for installation. 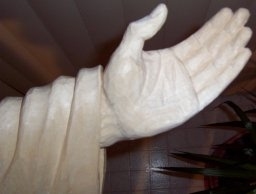 Detail of head and hand. Detail of stole and feet. Thank you for your comment. 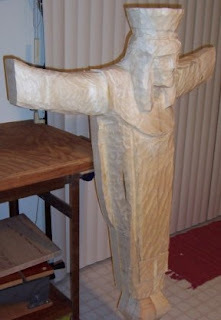 If you are interested in discussing a potential commission, please feel free to email me at hans@texaswoodcarving.com. Thanks!